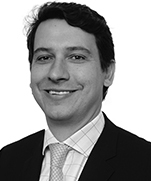 Marcos Renato Gelsi dos Santos is one of Vella Pugliese Buosi e Guidoni Advogados founding partners and the head of the Employment and Labor practice. With more than 20 years of experience, Marcos has a substantial expertise advising national and international companies and groups in a full range of sectors, with specific expertise in financial institutions, forest products and agribusiness, construction and aviation. His experience covers negotiations with trade unions, immigration, benefit and compensation plans and corporate transactions. He is also well versed in sensitive litigation proceedings before judicial and administrative courts. Marcos is recognized as one of the leading labor lawyers in Brazil by Chambers and Partners Latin America. “Great experience with financial institutions, technical expertise and the ability to find efficient solutions” (Chambers Latin America). “Excellence, assertiveness and authority in the employment area” (Chambers Global). He is also considered one of the most admired tax lawyers in Brazil by Legal 500 (Brazil).